Whoever at Microsoft thought I wanted animated comic book pages on my desktop was nuts. 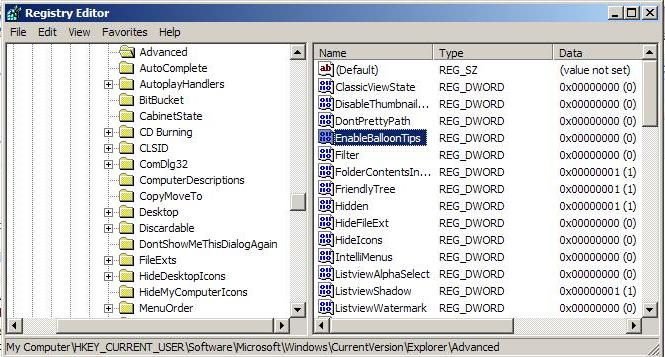 I’m talking about those annoying balloon tips that pop up every time something happens in Windows XP or Vista, even something trivial like “LiveUpdate is up to date.” Fortunately, balloon tips can be disabled everywhere in a single operation under XP or Vista. Both techniques are covered here. Windows XP requires creation of new registry key. Enter “EnableBalloonTips” as the key name, without quotes. Double-click on the EnableBalloonTips key to change its value. A value of “1” enables balloon tips. A value of “0” disables them. The same technique works in Windows Vista Home and Home Premium editions, except that you start regedit differently: press Windows+R then enter regedit. Select Enable to enable the removal of balloon tips. Confusing, isn’t it? Some critical notifications will persist even after balloon tips are turned off. For example, Windows XP advises you every time a WiFi connection is established, and when virtual memory is automatically expanded because it was getting too low. But these balloons pop up near the system clock in the lower right corner of the screen, pretty much out of the way. Your desktop will be a much quieter place more conducive to concentrated work when balloon tips are disabled.